Erected by their family as a tribute of affection in memory of. 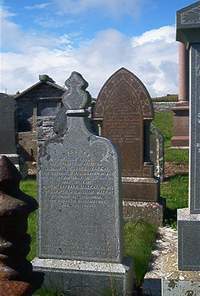 George Mackay tacksman of Achairn parish of Wick died at Roster 22nd June 1843 aged 66. Wife Barbara Mackay died 11th October 1862 aged 81 daughter of William Mackay of Aghoul Sutherlandshire.